1. 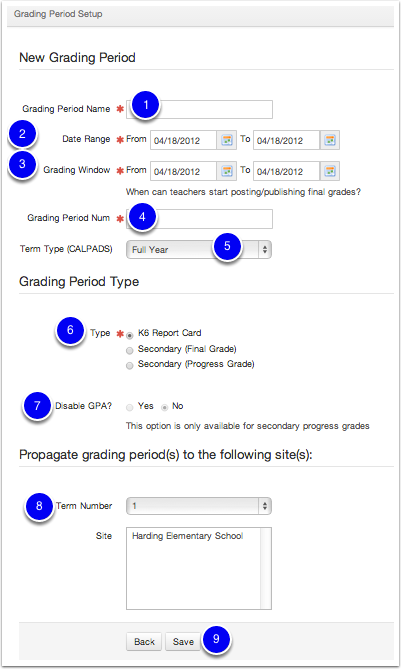 Click Grades (1), select Grading Periods (2), click Add (3). 2. Enter the first and last dates that grades will be recorded. This controls the Gradebook and how data is collected from a Gradebook. 3. Enter the first and last dates that teachers can enter/post grades for the final mark. This controls when shared Report Cards are available for data entry. If using Report Cards, it is recommended that the first grading period provides a longer window of time to accommodate for training and first-use practices. 6. Make the appropriate choice. For clients using Elementary Report Cards, always select k6 Report Card; Selecting "Secondary" is most common for Illuminate SIS clients and the use of secondary report cards. 7. Select No to Disable the GPA if you select Secondary (Final Grade). DNA only clients will skip this option. 8. Select the Term and sites you would like this grading period to apply to. To select multiple sites, hold down command/CTRL and select all of the sites you like. It is best practice if selecting multiple or a few sites, to always include the "district". For troubleshooting and easy use, all Grading Periods will then be accessible in the admin account when at the district level. 1. To edit, means to change or alter the information of the grading period selected. 2. To remove or delete, will completely remove the grading period at the site you are signed into. 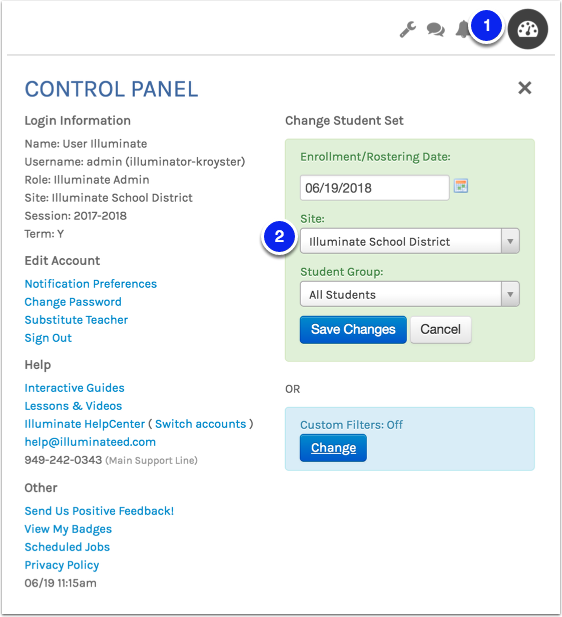 If logged in at the district level but the original Grading Period was applied to multiple sites, it will only be removed at the district level. 3. Print a list of all Grading Periods by means of Microsoft Excel, Adobe PDF, Other Formats, or with additional printing formating tools. When needed to change or edit Grading Periods, they can only be edited individually at the site level. If all Grading Periods were built at the district level, edit both the district and the site to keep information consistant. 2. Select the site you need to edit and refine the Grading Period for and the Grading Period page will update to the site selected. Now that you have created Grading Periods, learn more about Getting Started with Gradebooks or for building Elementary Report Cards, take a look at Step 3 - Create a Student Group!